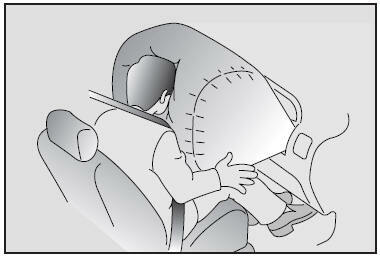 The front seat passenger’s air bag is much larger than the steering wheel air bag and inflates with considerably more force. It can seriously hurt or kill a passenger who is not in the proper position and wearing the safety belt properly. The front passenger should always move their seat as far back as practical and sit back in their seat. It is essential that the front passenger always wear their safety belt, even when the vehicle is moving in a parking lot or up a driveway into a garage. The reason for this is that in most frontal impacts, the occupants are thrown forward. If the right front passenger is not wearing their safety belt, they will be directly in front of the storage compartment when inflation occurs. In that situation, serious injury or death is possible. Pre-impact braking could throw an unbelted passenger toward or onto the air bag storage compartment. In the collision, the air bag would rapidly inflate and could severely injure or kill the unbelted occupant. Never place a rear-facing child restraint in the front seat. A rear-facing child restraint would be positioned too close to the air bag. If the air bag deploys, it would impact the rear-facing child restraint, causing serious or fatal injury. Failure to observe the instructions provided with the child restraint system could increase the risk and/or severity of injury in an accident.